I have done Masters of Arts in Special Education from University of the Punjab in first class. I am serving the University of the Punjab since 2005. 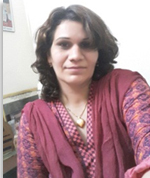 I have done my Ph.D. from the University of the Punjab, Lahore in 2012 in Special Education. My area of interest is research and teaching. I am teaching both at Master’s and M. Phil levels. I have written and published may research papers in the field of special education particularly in the areas of hearing and visual impairment in HEC recognized and impact factor Journals. I have successfully supervised and completed two theses of M. Phil and currently supervising six of M. Phil and one thesis of Ph. D. in special education. I have attended and presented many national and international conferences in Pakistan and abroad including USA and Bangkok. Conducted research projects with UNICEF and UNESCO. I have delivered many lectures on special education, inclusive education and management of inclusive classrooms. In workshops arranged by the different training institution on general education and special education particularly DSD, Allama Iqbal Open University and Department of special education, government of Punjab. Areas of Interest: Curriculum Adaptation, Research, Inclusive Education, Administration and Management, Computer Application in Special Education and Education of the Visually Impaired Children. M.A (Special Education) (Pb), Ph.D.